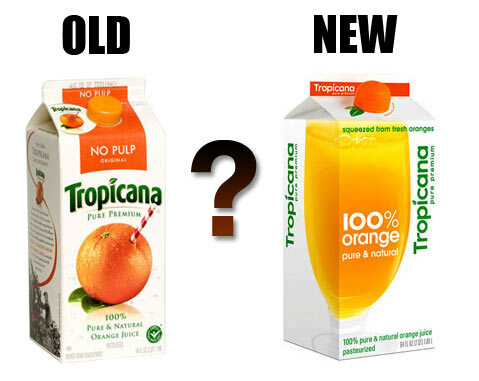 Just two months ago Tropicana (owned by PepsiCo) dropped it’s new carton design (created by Peter Arnell of the Arnell Group) on consumers. That is it up there on the right. Needles to say, US customers flipped out (as they really do fear change) and bitched and moaned to Tropicana headquarters. Comments about the new packaging (containing the same product inside) were in the range of ‘ugly’, ‘stupid’ and ‘a generic bargain brand’. They also mentioned that it was hard to differentiate between their different juices. Tropicana listened to their customers and, saying that they, “…underestimated the deep emotional bond” their loyal customers had with the product, have said that they are returning to their old package design. Even the designer (possibly one of the worst bosses in New York) has sided with the head honchos at Tropicana North America on this one saying, “Tropicana is doing exactly what it should be doing. I’m glad Tropicana is getting this kind of attention.” The only thing that they are keeping is the new cap design. What do you think? Do you drink it? Does it matter to you? Which one do you like better? If I get 50 comments on this post I will raffle of the latest edition of McSweeney’s Quarterly. Family is excluded from raffle. Sorry Karen and Marc.